My tasty mashed potato patties are addicting and a perfect way to use leftover mashed potatoes. Homemade potato side dishes are a wonderful accompaniment to any meal, and you will find them at the end of the page. Heat a skillet to medium, and add the butter and canola oil. Mix the egg and mashed potatoes together and then add the flour, baking powder; mixing well. Finally stir in half of the chopped green onion and cream (milk will work too). Mix well. Shape out patties with your hands and place in skillet. Brown on both sides. Serve with sour cream and the remaining onion on top. 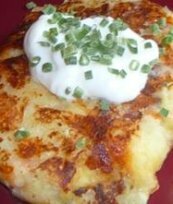 You may also add chives and Parmesan cheese and served them with sour cream on the side. Or you may add cheddar cheese and chopped crisp bacon - possibilities are endless.